We have been gone for a week now. I have been trying to think of how to describe how we are going and how we are feeling but I’ve been struggling to put it into words. And then suddenly, as I was walking home from the supermarket tonight, holding Elyssa’s hand in one hand and a bag of potatoes, cheese and sour cream in the other, I realised why. It just feels like life! It all feels completely, wonderfully,’ normal’! And the funny thing is I don’t even like that word. What is normal? But right now, I can’t think of another word that even comes close. 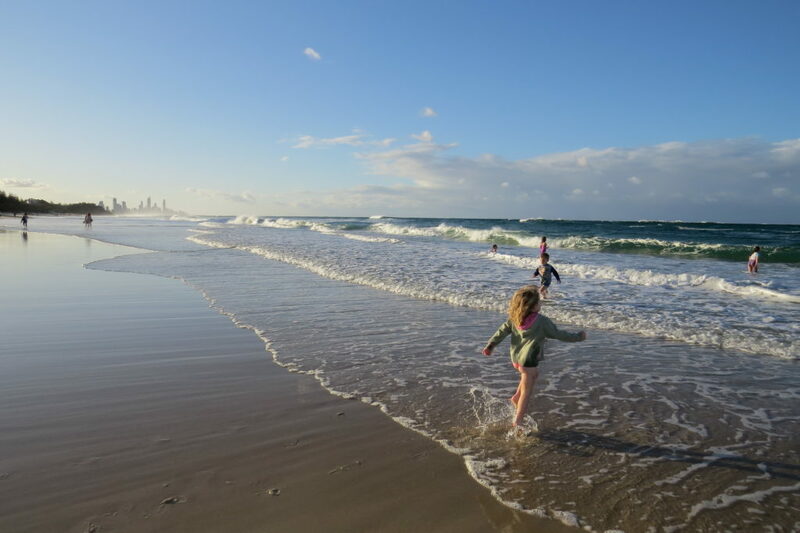 Maybe it’s partly because we have stayed in this apartment before, or because we are already quite familiar with the Gold Coast or maybe it’s just because we are meant to be here, doing this. The simple fact is though, that it all feels right. It just feels like life! It’s been a great week. Some days we have just ‘hung out’ and done very little. Some days we have been boring and shopped for groceries and focused on computer work and schooling. Some days we have been full-on tourists, complete with camera around the neck and kids alternating between happy excitement and over-tired melt-downs. But whatever we’ve been doing, we’ve been doing it together and that is exactly what this new life of travel is all about for us. That, and exploring this awesome planet! 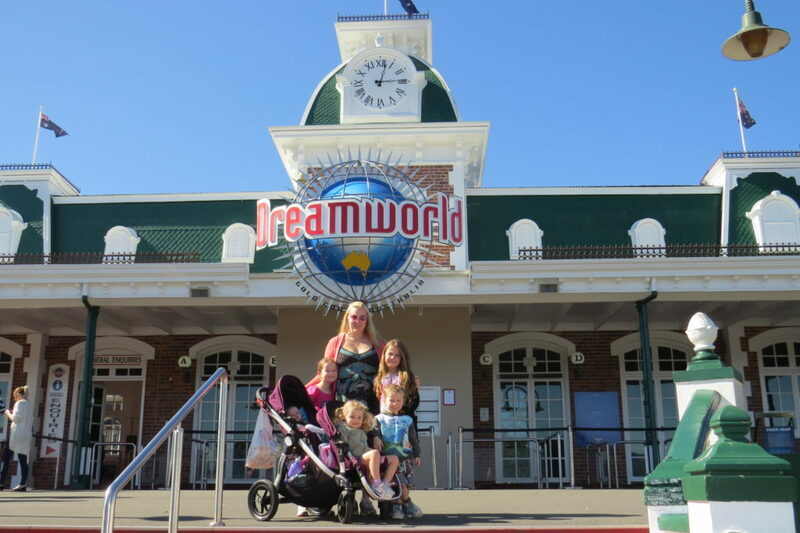 One of the biggest highlights for the kids this week has been our visits to our two favourite theme-parks – Dreamworld and WhiteWater World. We bought annual passes, which allow entry into both parks, on our visit to the Gold Coast last year as they were only about $10 more expensive than a 1 day pass, and they are still valid until the end of this week. 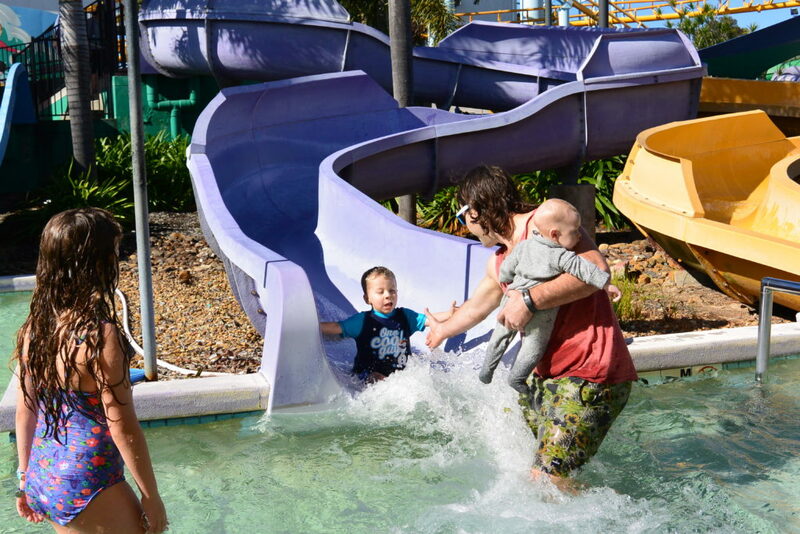 On our first visit we headed straight to WhiteWater World, keen to make the most of what felt like a hot day in comparison to the Melbourne winter we had left behind. We realised it really must have been a long time since we had been anywhere near water when Korey saw an older man wearing only shorts and said very loudly “Ewwwww, that man’s naked!” The kids have had a ball going on endless waterslides as well as all the awesome Dreamworld rides and as the parks have been relatively quiet we have barely had to queue for anything which has saved us a lot of time. We have spent a fair bit of time at the beach as well this week. 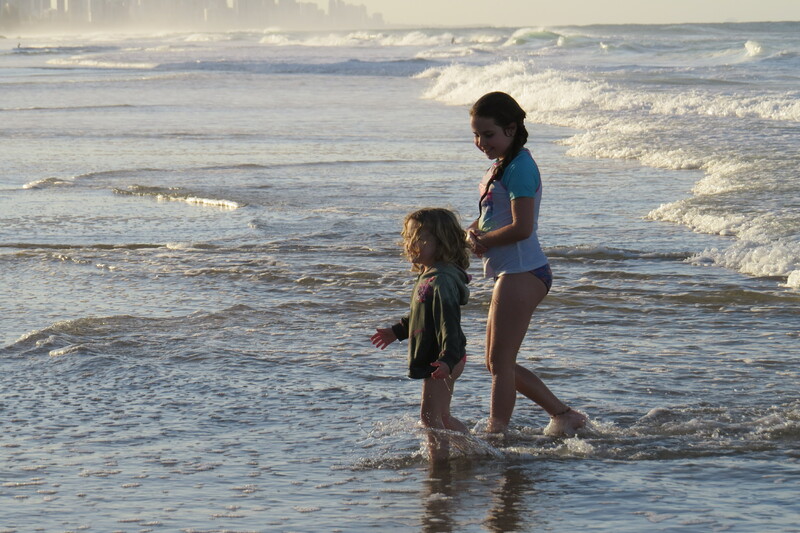 The kids love the water and any opportunity they get they will run in and have a splash around. They really are crazy though. Yes, the sun is shining, but the water is still freezing. A woman walked past when they were waist-deep in the water yesterday and said to me “you’ve got to be from down south.”! We are definitely getting fitter being here. 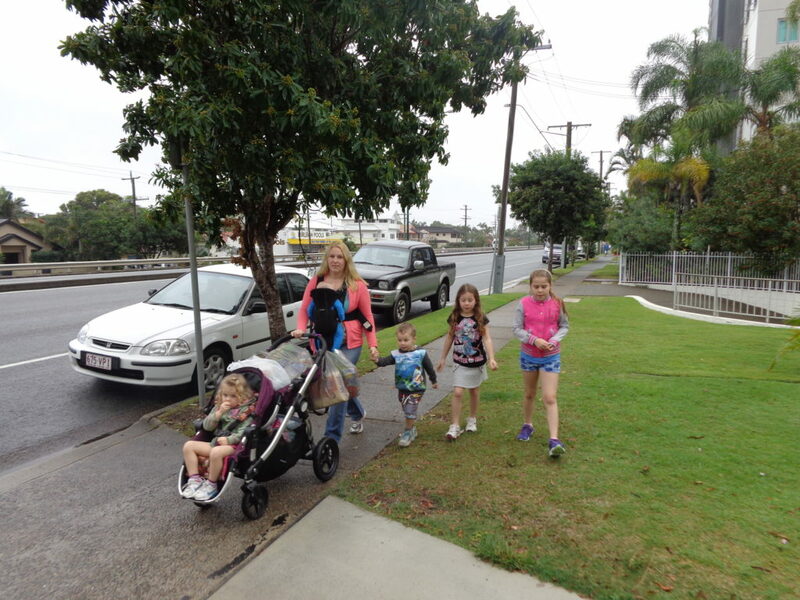 If we are not walking to and from bus stops or around theme parks or along beaches, we are walking 2 kms to the local shopping centre and back. As we are trying to keep to a strict budget in order to sustain our travelling long-term, we’re looking for the cheapest options. We’re not hiring cars and we’re trying to minimise cost as much as possible by walking when we can. Yesterday I walked to the shopping centre on my own with all 5 kids. I had Ben in the carrier and was pushing the double pram with Anna and Elyssa on either side of me. I love the looks I get. Some are of admiration, some are of shock and some clearly say ‘you are nuts, lady’! Even when it’s Pete and I together with the 5 kids so many people seem amazed. We always have people saying things like ‘you’ve got your hands full’ and ‘are they all yours?’. It’s quite entertaining when we go on to tell them what we are currently doing. 95% of the time, the comments are positive and encouraging. One lovely lady told me I had rocks in my head the other day. Got to love an open mind! We haven’t done much in the way of home-schooling yet as we’ve had a pretty busy first week but Pete has come up with an idea to start things off. 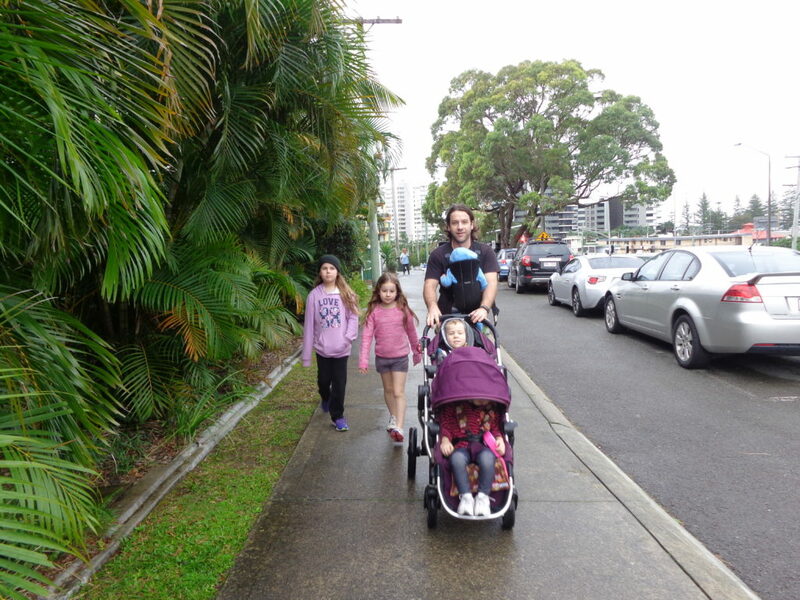 For the last couple of days, he’s been taking the four oldest kids with him for a morning walk along the beach pathway for about an hour or so. 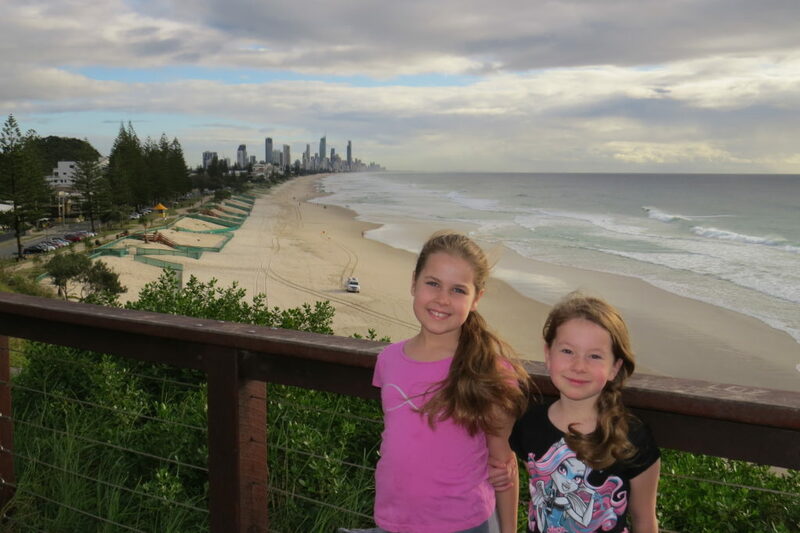 While Lucy and Korey are in the pram and then playing at the park, Anna, Elyssa and Peter recite the times-tables, do spelling practice and talk about geography and history as they go. The girls really enjoyed this and were very happy to keep doing it each day for the entire walk. Pete said that he got quite a few interesting looks from people as they all walked along loudly reciting “three times four is twelve, four times four is sixteen, five times four is twenty….”. We are slowly (probably a little too slowly) getting organised and prepared for overseas. Despite what I thought was very careful and precise planning, we have realised already that we have over-packed. We are working on downsizing, re-evaluating our luggage and sorting out all the last minute things we need to do and buy before we travel. I still can’t quite believe that in just over a week we are flying to the other side of the world! Oh yes, one of my thoughts would also probably be ‘you’ve got rocks in your heads’ but it would be quickly followed by ‘oh I’m so jealous – I love travelling, and travelling with the kids would’ve been awesome. Travelling is great and such fantastic memories for all of you. Your kids will become so broad minded, and have many experiences that they will remember for ever and a day. Thanks, yes the whole thing is a bit of a crazy endeavour, but already we have made some amazing memories and the kids are learning so much about life and the world around us, it’s priceless. Thanks for reading!